This is a layout idea that has been bumbling around for a few months. It all started with a thread on RMweb, describing some possible ideas for the 2mm Association Diamond Jubilee layout challenge. This involves developing a cameo layout with visible dimensions of 600 x 240mm. That’s a tiny space, but it’s surprising what one can come up with in the space. Perhaps not surprisingly, many ideas were urban, where the railways didn’t have much space anyway. So this is the design that caught my eye, based on the old LCDR Ludgate Hill station, just to the north of the River Thames, and a stones throw from at least three other stations. It didn’t stay open for long, but the remains of the station lasted until the Thameslink remodelling, completed around 2012. The layout sketch below shows the station in its early 20th century form, with some wonderful pointwork. The bottom two lines go to Holborn Viaduct station, just off the plan. The top two drop down to Snow Hill and then through to Farringdon and to the north London stations. Early last century, there were services across London, and visiting trains from the Midland and LSWR. Plus masses of cross-London goods, that continued into the 1970’s. These lines, greatly modified, now form the route for Thameslink services. And this is how the layout might look, though this is the post-war look after that nice Mr Hilter from the Ball and Compass (Monty Python reference) thinned out the buildings during the 1941 Blitz. And here’s a view early in the century, with all buildings intact and a train of private owners wagons – empty coal traffic – heading north. In our era of gas central heating, it is easy to forget just how much coal traffic there was from the northern and midlands collieries down to London. Every suburban station would have had a coal yard, now converted to a car park or blocks of flats. This drawing from ‘The Engineer’ shows the remodelling of the original station, abandoning one platform, still early last century. The pointwork is marginally simpler! To model this sort of pointwork, one would have to work in 2mm or one of the larger fine scales. Otherwise, the clearances in ‘N’ for frogs and wing rails would just not work. Here we see an attempt to draw that complex pointwork in ‘Templot’. It does show how accurate many of the large scale Ordnance Survey maps are – the map can be tied in very well to the Templot trackwork. But it’s when you look at the site in the context of its surroundings that one sees the potential of the area for a model. Here’s the circa-1900 plan. And here’s the circa-1950 equivalent. The trackwork is noticeably less complex, and with a little further simplification would be buildable in ‘N’. The track centres might need to be slightly increased, from the absolute minimum 6′ way of the prototype (22.5mm or so) to the PECO standard of 27mm, to fit everything in. Holborn Viaduct station has lost all its loco spurs, and gained longer platforms for 8-car suburban EMU’s. It’s when one draws some distances on the maps that one realises how small the station is, and how good a model it could make. The three lines below are 1m, 4′ and 6’6″ long. All could make a good layout. The walls of Ludgate Hill station make a natural scenic break to the left. For the longer layout, the overall roof does the same job to the right. I like the idea of a hollow ply half-door forming the basis of the layout, strength being added by the raised railway on the viaduct. Trackwork would have to be hand-laid – code 40 would be ideal. A lighting ‘proscenium arch’ a la Iain Rice would limit the views left and right. Perhaps the foreground could be made more interesting by assuming a few buildings survived the bombing, and the whole area hadn’t become waste ground and car parks. Operation would be interesting. There was a busy commuter service into Holborn, and I believe that the platforms at the bottom of the plan were used for non-passenger stock and van traffic. And the two lines to Snow Hill dropping below the station carried a range of cross-London goods traffic, with a range of locomotives from the Southern and other regions. Perhaps the most difficult part of the design is the fiddle yard. 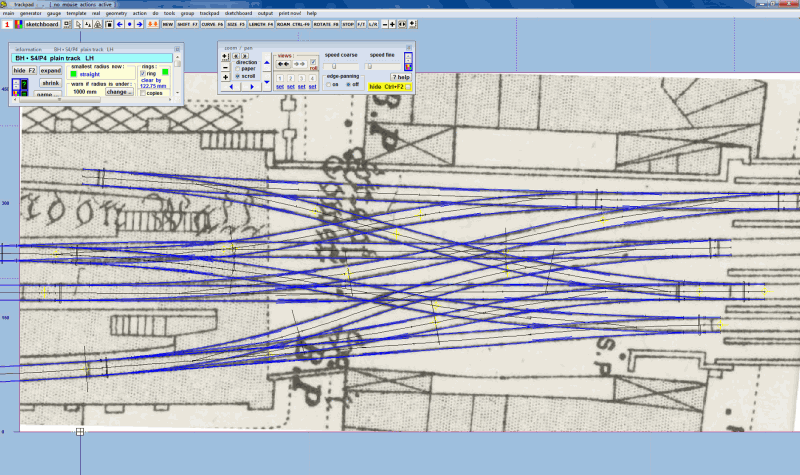 For home use, I might leave the Snow Hill lines unconnected, and then add a fiddle yard or loops onto the end of Ludgate Hill station. For exhibition use, a second set of loops could be added to the Snow Hill lines, but this is becoming a large layout. 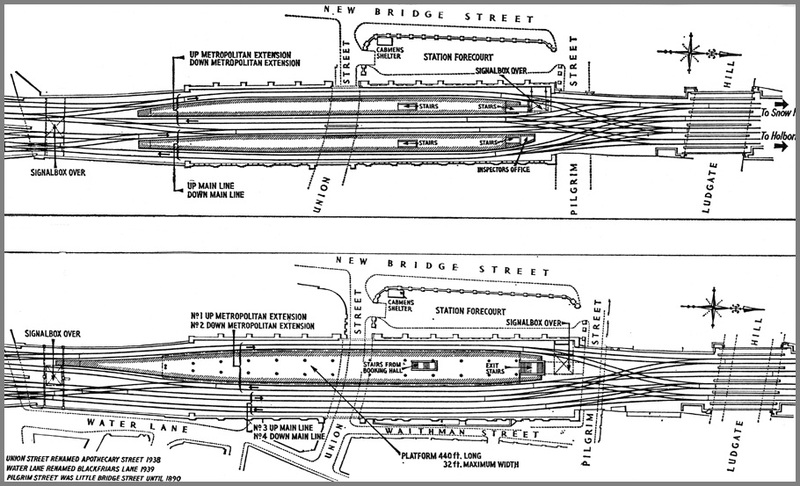 Perhaps a continuous circuit, with a double ended fiddle yard would be best, allowing you sit and watch trains running through Snow Hill. The end curves would have to be a reasonable size, not less than 15″ day, to allow for steam engines to run freely. I’m still thinking about this question. The other issue is the size of the boards. With all those points, it’s difficult to find a natural place for the baseboards to join. A 6’6″ half door is transportable, but may be a stretch for most cars. And it might be difficult to get it out of the house – I had enough trouble getting the 6′ x 2′ Kuritu into my loft! Finally, here are a couple of photographs of the area. 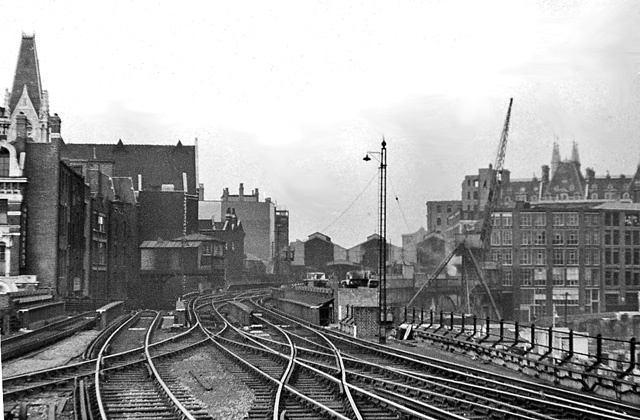 The first, taken in 1953 I think, looks towards Holborn Viaduct with the Snow Hill lines dropping under the signal box to the left. 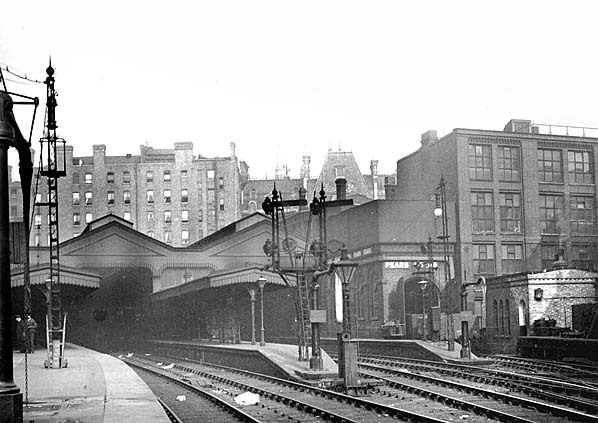 The second shows Holborn’s overall roof earlier in the century, when there was still a small engine shed to the right. So there it is – (one of) my (many) dream layout(s). I doubt whether it will ever get built, but there is a delightful model there for someone.